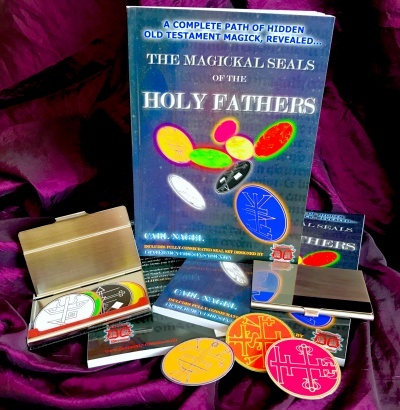 Containing a powerful Initiation Ritual, to link you DIRECTLY to the Brotherhood of the Holy Fathers, this work is utterly UNIQUE as each and every copy comes with a COMPLETE SET OF RITUALLY-PREPARED SEALS, anointed with a powerful blend of Holy Magickal Oils, and ready to use! The more each of these powerful Seals are used, the stronger their effects are said to become; make no mistake - this Book and Seal set could potentially become the most valuable items you will ever possess! Within the pages of this wonderous, living Magickal system, expertly written by Occult authority Carl Nagel, you will find Rites and Orisons to use with each of your Seals - each and every one carefully designed to attract a POWERFUL LANDSLIDE of Divine Blessings. Written in Nagels signature no-nonsense, jargon-free style, The Magickal Seals of The Holy Fathers is a beautiful, POWERFUL system of Magick that you will benefit from, and return to, time-after-time.